Ok, yeah, I know….HORRIBLE post title. the original photographer, for posting this ad! Most people know Steve Rocco from his antics, success, and overall world-changing career on the business side of skateboarding. But when I was a young skater in 1978/79, Steve was one of a new generation of flatland freestyle skaters. My early freestyle heroes were guys like Chris Chaput, Russ Howell, and Ed Nadelin. When Rocco began to appear in Skateboarder Magazine my mind was blown. 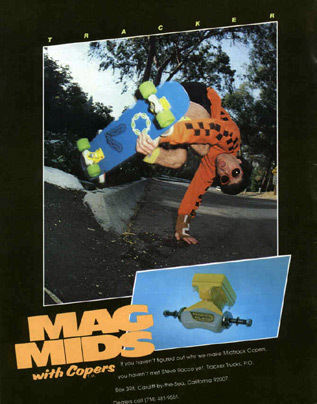 Here was a guy bringing a more aggressive skate style to freestyle.He was also noted for adapting vert tricks to the street, and as such is really one of the early proponents of street skating (as you can see in this tracker ad). Rocco’s “Whos’ Hot” article in Skateboarder further blew my mind. I’d never seen a 50/50 fingerflip before, or any rail tricks like the Casper Disaster he was pictured doing. Of course, back in those days no one had camcorders. A few people did, however, have Super-8 film cameras. Footage from these home movie-makers is usually the only footage available of skating from the 1970s and very early 80s. This video was posted on Youtube by Maurice Meyers, brother of former pro freestyler Ray Meyers. In addition to seeing some early footage of Ray, this is the only footage I’ve ever seen of the young Steve Rocco. The Rocco material starts at 6:05. As you can see, Steve flows and carves around — on trucks that TURN. Yes, turning, carving, and speed in a freestyle run. Soooo good to see. Comparing his style to anyone at the time I’m sure you’d see that he skates it much more like street skater than anyone else, though within that aggressive run is technically solid and consistent freestyle that was advance for the time. Apparently Rocco was winning everything around this time — until Rodney Mullen showed up on the scene. Bit thanks to Mr. Meyer for posting this stuff!